07.10.2011 | OTOC commences Exploration Camp construction. 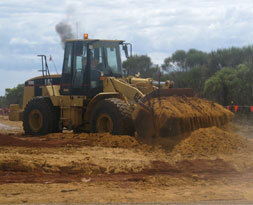 Work has commenced on the civil and construction activities for the Asia Iron Australia Extension Hill exploration camp. Ocean To Outback Contracting (OTOC) Australia, who have been contracted to build the camp and associated infrastructure, mobilised their team on Monday 17th October. The camp itself will take several months to complete and will be capable of supporting the ongoing and future exploration programs.